The Visayas, a group of islands has no single and distinctive specialty for the whole region. Being a coastline region, common among recipes is seafood. You will definitely love the array of Philippine cuisine from the Visayas. Here are 6 of the famous Visayan food to look for when you visit the Visayas Region. Kinilaw, which is fish or shellfish marinated in vinegar or sour sauce, can be considered the most famous Visayan dish. Some islands prefer it cooked in different ways— with coconut cream, or chili, or lime and palm wine vinegar. In many Filipino get-together, the kinilaw is a favorite appetizer during beer-drinking sessions. Pancit molo is an Ilongo dish .The savory soup originated from Molo, Iloilo City; thus, the name Pancit Molo. Filipinos eat noodle soup in any meal; however, pancit molo doesn’t have noodles at all. It’s just wanton and soup. But it is a popular choice for snacks influenced by Chinese cuisine. Dumplings, pork, chicken, and sometimes flavored with prawns make this dish more inviting. Dumplings, pork, chicken, and sometimes flavored with prawns make this dish more inviting. For vegetarians, lumpiang ubod (spring rolls) is made with strips of palm heart as filling, with a soft egg wrap. It can be fresh and served with peanut sauce. Lumpia can also be fresh (lumpiang sariwa) and served with peanut sauce. Some people prefer fried spring rolls and dipped in spiced vinegar. Then there’s “La Paz Batchoy” made from pork organs (liver, spleen, kidneys and heart), crushed pork cracklings, vegetables, shrimp, chicken breast or beef loin, shrimp broth, chicken stock and round noodles or miki. The noodles are similar to spaghetti but are generally a bit finer. The basic ingredients are stir-fried, added with shrimp and chicken stocks. 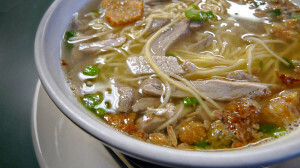 It is added to a bowl of noodles and topped with leeks, pork cracklings (chicharon) and with raw eggs cracked on top. Chicken Inasal is Bacolod’s best-known chicken recipe. It is a type of chicken barbecue marinated in calamansi (native lemon) and annatto seed. This Visayan food is best with steaming rice and some mix of condiments and spices such as soy sauce, or fish sauce with some crushed garlic and minced onions for more flavor. Another chicken dish, binakol, is cooked in coconut juice and makes a hearty afternoon snack by the people of Iloilo. It is similar to another chicken soup recipe, the chicken tinola, except that the soup base is of young coconut juice. However, this Filipino recipe can have variations, too.